Yet something was wrong. I suddenly found myself stuck behind a podium, unable to move. Constrained by a microphone and the keyboard of the laptop. That’s when I started looking for solutions. I liked presenter’s view, yet I hated the constraints of the podium. I longed for the security to see the upcoming slide, yet it often made me look down and read my screen. And then there was the microphone. The dreaded podium microphone that made me stand completely still only inches from it. Frozen in place. Spending some time at my local electronics store brought me two solutions. 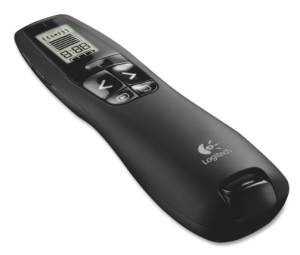 The first was the wireless presenter R800 by Logitech. This wireless unit lets me be a hundred feet from my laptop with push button control of my slides. It’s very compact and fits nicely in my hand, and it gives me two additional features; a laser pointer and a black screen button, which allows me to hide my presentation with one easy click. I then picked up a wireless lavalier microphone which let me roam the stage and the room with ease. 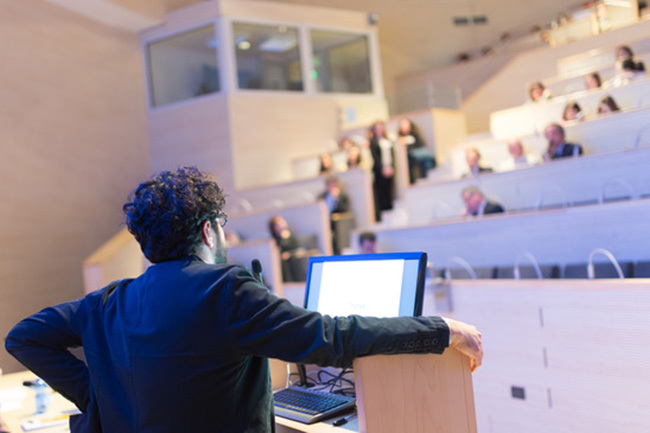 Now I was able to interact with my audience, build rapport, and then instantly turn the focus off of the slides and back on myself, the speaker. Lose the bullet points and use visual slides with a limited amount of text. In my next presentation, my slides had powerful pictures or graphic images, with only a few words on each. This brought the focus back to my speech and not on the slides. Suddenly I had the audience’s attention. It required that I tell stories and add anecdotes, which made for a much richer presentation. I wasn’t reading my slides; they were adding to my story. I noticed that the people in front of me were bright eyed and following along, instead of yawning and falling asleep. With these two simple tools and a change in my slides, I was now free. I had liberated myself from the prison of the podium which led to one additional perk… better reviews. With the addition of two simple tools, my presentations took on a life of their own. I said goodbye to the Powerpoint podium and hello to my audience.